January - August 2019 Programme Out Now! We will be hosting our first annual contemporary print event, on Saturday 13th July, 11am – 5pm. Discover printmakers from across the UK, as they showcase printmaking in its various forms; including relief, letterpress, intaglio, monoprint, silkscreen, bookmaking and lithography. Our studio shop is open, selling artist prints, hand printed products and curiosities, greetings cards, books, printmaking materials and gift vouchers. Open Tuesday to Saturday 10am – 5pm. Late night opening on Wednesdays until 8pm. Come to LPW to explore how to transform your work with a variety of print processes. Check out our course programme for upcoming courses in Solar Plate, Photo Etching, Experimental Photo Screen Printing and Photo Lithography. Our upcoming Print Club is all about Intaglio. Printing from beneath the surface, explore mark making, inking and use of Chin Colle in a supported environment, with access to a technician who will have you working independently in no time. We’re running NEW courses for Young People in 2019. Proud to support Arts Award, we are running Arts Award Discover in a Day and Arts Award Explore in a Week sessions, as well as a Mini Print Club for young people aged 12-16 to learn how to screenprint. Saturday 27th April 10am - 4pm. Wednesday 1st May 6pm - 8pm. 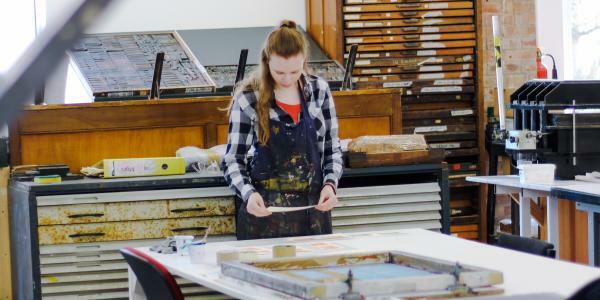 For the first time Leicester Print Workshop is inviting artists to use the facilities in our Studio during open hours, on an independent basis.